Why Don’t We Have Peace? Here’s Why. Thousands of people have already crowded into the sprawling Kalachakra Temple compound in Dharamsala, India by the time my husband and I arrive at 8:00 a.m.
We’re gathering in anticipation of His Holiness the Dalai Lama’s first day of teachings at the very temple where he has his private chambers, and where he frequently addresses the public. Everywhere you look, your eyes rest on a sea of Tibetan monks, nuns and laypeople, a sizable smattering of foreign tourists and a substantial sprinkling of Indians, many of them journalists, cameras and video gear in tow. As we thread our way through the crowd, I get the sensation that this colorful medley of humans, against the ornate backdrop of the temple, resembles a living, breathing and moving mandala- the cosmic order come to life. There is infinite possibility on this cool, crisp morning; all mysteries might just reveal themselves in this gathering of good intentions and open hearts. We walk upstairs past a jam-packed garden to where there are two prayer halls, one of which the Dalai Lama will use to transmit his teaching. In and around these halls hordes of people sit, in hallways, on staircases leading to toilets, by a room full of ever-burning candles and by the cellar kitchens where butter tea is being boiled. As we look for a small space to squeeze into, a child’s voice crackles an adorable, stilted chant through the loudspeaker system; his voice rings with the crystalline innocence of youth. Others, like us, are navigating the crowds searching for an empty spot. Ropes have cordoned sections off, and security is still ramping up for the Dalai Lama’s arrival. We jostle our way into small opening by a large column that faces the large hallway the Dalai Lama will soon walk down. Not too far ahead are a couple of stairs leading to the antechamber he’ll enter to reach his chair in the prayer hall. We arrived twenty minutes early, and the teaching is evidently going to start late, so we have time to stand among the sea of visitors, to observe the goings on that lead up to an event of this magnitude. The smart ones who arrived early spread out mats and sit on cushions, many quietly munching on snacks. Tibetans and foreigners are chitchatting, smiling and laughing side by side. Two of the security guards near the antechamber entrance, Indians, are rail thin, mustached, ever-smiling and holding long, austere-looking rifles. At intervals, various monks inhabit the holding area leading to the antechamber, and I keep expecting each one to be the official greeting party for the Dalai Lama. But then they leave and others take their place. Time seems to be lackadaisically seeping outward rather than moving forward in chronological sequence. At a minute to nine, an older Tibetan man in a royal blue apron who’s been standing by the stairs the whole time, disappears into the antechamber and scurries back out with a bright yellow ribbon. He painstakingly goes about wrapping it around the stair rail that the Dalai Lama will use as a support on his way up. He corrects it, flattens and presses it again and again until it is absolutely perfect and he’s satisfied. This tiny gesture, almost lost in the tide of brewing excitement, deeply moves me as emblematic of the purity of honest work and holy servitude. This bright yellow ribbon that forms a vibrant part of our view on a very special day, strikes me as a beacon of far more. Sometimes we wonder about arguably overwrought rituals in spiritual tradition, and in our cynicism, declare all the pomp and circumstance excessively elaborate, meaningless and unnecessary. We find infinite things to feel sour about as we get lost in the details and distractions of our lives and lose sight of the small marvels happening around us at every turn. I couldn’t argue with any degree of certainty about role of ritual in our lives or spiritual practice. My own views keep changing with time as the rest of me evolves and adapts to the life I find myself living. But what I feel deeply, looking at the man with the yellow ribbon, is that every single action affects the universe. Every act of true devotion brings out the light in the one who is devoted and that light reaches all of humanity. Everything we do that is in service of something greater than us builds into a momentum of positive energy that will only expand with our combined efforts. Before the teachings have even began – before the deliciously strange butter tea is served to thousands! – lessons arrive right in our laps. I can’t help but feel these lessons were meant for us to discover. One yellow ribbon taken in isolation is a shiny and slightly garish curiosity. A yellow ribbon lovingly handled to mark a great occasion by a man who, just like the rest of us, has good days and bad, depends on others and has dependents of his own, and wants to be happy and free of suffering, is a beautiful manifestation of connectivity at work. The care that emanated from those aging hands arranging one yellow ribbon one the first day of the Dalai Lama’s public teachings, those inordinately generous offerings, is also the care and love that feeds the world. *This article was published on The Tattooed Buddha. Who is Our Inner Witness on the Spiritual Path? In yoga and in our spiritual journey, we seek the transcendence of duality, the arrival of unity between ourselves and the cosmos, knower and known, observer and observed. One of the ways we work toward this unity is through meditation, by learning more about how to tame the mind’s wild and roaming ways. But immediately, a question arises: who is the “we” in relation to our own minds? Who exactly is it that can control our minds, which we so often associate with our very sense of identity? How are we different from our minds? Once we start meditating, we learn pretty quickly, through direct experience, that there is a part of us able to “watch” or witness ourselves meditate, and that “something” accompanies us off the cushion and into our lives as we become more mindful and present in our daily lives. When we are instructed to observe our in-breath and out-breath, suddenly there “we” are, as though from the outside, tracking the breath’s movements. We are also aware of becoming distracted, and we can guide ourselves – our own minds – back to the breath. This “witnessing consciousness” is also known as a kind of meta-consciousness in scientific terms; it sounds fancy and official, but that doesn’t make them any less mysterious! When I think of the witness or observer as I normally understand the words, two visions come to mind. I think of the unobtrusive but interested observer, maybe collecting scientific data (though the Heisenberg’s uncertainty principle teaches us that the act of observation changes that which is observed), or maybe sitting a cafe watching life pass by, somewhat aloof, but with great curiosity. The observer seems to be guided by a higher principle or motivated by a desire to reach greater meaning. When I think of the witness, my mind floods with images of those who have been at the scene of momentous events like calamities, natural disasters, or the terror of war, who make an active decision to record and transmit what is being witnessed, so that the world can become more compassionate and future generations can benefit from the mistakes and tragedies of the past. As a granddaughter of Holocaust survivors, I have been privileged, and sometimes overwhelmed by becoming the legacy and carrier of unimaginable things experienced and witnessed by loved ones. As I write this, hundreds of witnesses are chronicling the ravaging effects of the Nepal earthquake, tearing our hearts apart and inspiring us to help. In an age of instant media access, we are all becoming witnesses, with the privileges and responsibilities this entails. What is the overlap between a “mere” witness to events and someone with feelings and conditionings who experiences the event? Can any being ever be neutral, whether out there in society or within our own selves? Until we experience pure One-ness, we are always a little bit “in” and a little bit “out” of things, and this can be a confusing place to be. It may well be that the common denominator between the worldly witness and the inner witness is compassion, and the merging this allows between a self that is conflicted or divided within the universe. Grappling with the witness and observer can be a chaotic endeavor, but I think it’s important to understand this special consciousness inside of us, so that we can become more conscious beings in a world that desperately needs this from us. Rather than try to understand it intellectually, I’ve tried, below, to delve right into the “my inner witness,” using my meditation practice as the basis. 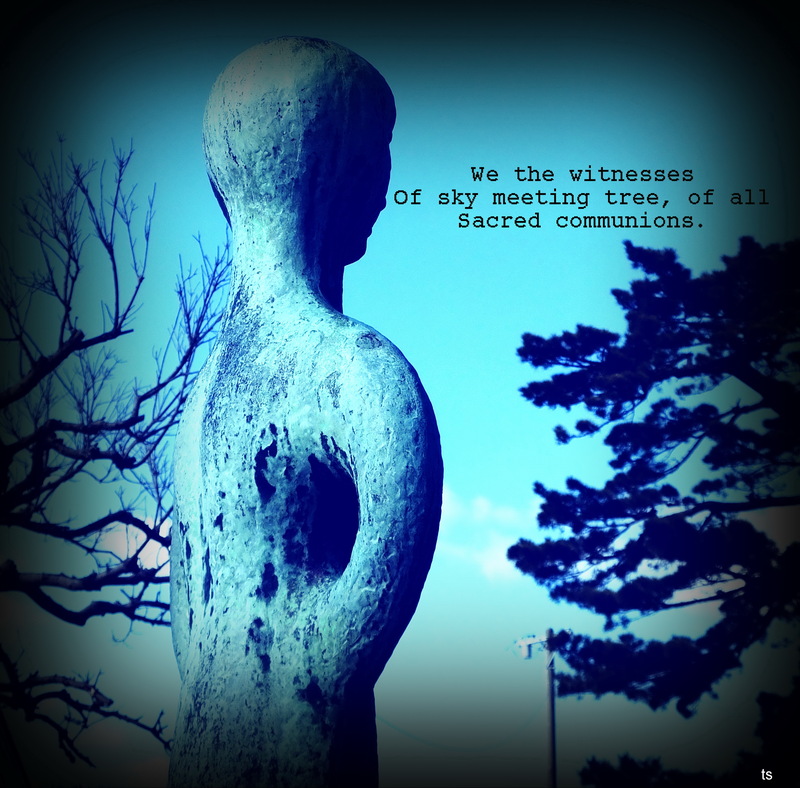 If the goal is to lose the witness altogether and merge into a compassion-flooded whole, then this is a humble attempt to bring the witness into sharper focus. I would love to hear any thoughts regarding this phenomenon! The witness tells me I’m thinking while I try to clear my mind, and brings me back to my body. The witness stands guard but does not offer solace. The witness observes me “be” as though from afar, while remaining a part of this “me” fabric. The witness guides me into nature when I need comfort and solace, and disappears when I am in rapture. The witness points me to the physical effects of my confusion, by way of telling me that I am not my confusion. The witness asks me if I’m being honest with myself. The witness doesn’t argue with any other part of me, even as the parts argue with each other. The witness doesn’t have the same goals for my life that I do, and doesn’t get frustrated when the goals I set are not met. The witness seems to want what is best for me, or at least doesn’t veer me in the direction of harm. The witness is not a friend or an enemy. The witness knows what I am doing but doesn’t make any judgments. The witness asks for nothing the way other parts of me ask me to tax myself over and over. The witness is not a master or a guru. The witness allows me to be more attentive. What do I do with this attention? Which part of me is the keeper of my stories and the inspiration behind the dreams I long to fulfill? Can the witness take me there and beyond … or can it only witness the evolution?